Put the minced chicken in a large bowl and add olive oil, eggs, bread crumbs, soda, chopped spring onions, salt and freshly ground pepper. Knead until the mince begins to make small fibers, roll into burgers and let them rest, covered for about 20 minutes in the freezer. Allow a large non-stick pan to heat well over high heat and sear the burgers well from both sides. Place the burgers on a non-stick baking tray and bake in a preheated oven at 180C degrees for another 14-16 minutes. In the last 4 minutes, add the bacon slices to cook and in the final minute put the cheddar on top of the burgers, finishing with the buns so they warm up. While the burgers are baking, place all the ingredients for the feta cream in a small blender: feta cheese, milk, olive oil and freshly ground pepper; beat until a nice cream is formed. 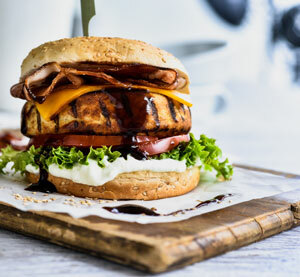 Place the feta cream on top of the bun first, then the tomato, the lettuce, the burgers with the cheddar on top, the bacon on top of the burger, finishing with the BBQ balsamic cream before closing it with the top half of the bun.